Mycoplasma pneumoniae is responsible for more than 20% of community acquired pneumonia cases, and capable of causing upper respiratory illness as well. Complications of M.pneumoniae infections include CNS involvement but other as pericarditis were also reported. The lack of feasible culture methods and under appreciation of the pathogens ability to cause invasive disease leads to reduced number of diagnosed M.pneumoniae related complications. In contrast to many other respiratory pathogens causing pneumonia, M. pneumoniae related severe pleural complications were almost never reported. We report a previously healthy 57 years old woman presented with indolent massive right pleural effusion, leukocytosis and elevated ESR. Extensive microbiological evaluation didn't reveal any pathogen in the pus even before antibiotic treatment was started. Surprisingly, M.pneumoniae DNA was detected in the pus from the empyema using PCR designed to detect M.pneumoniae. A serological assay (Serodia-Myco II) using convalescent serum was indeterminate with a titer of 1:80. 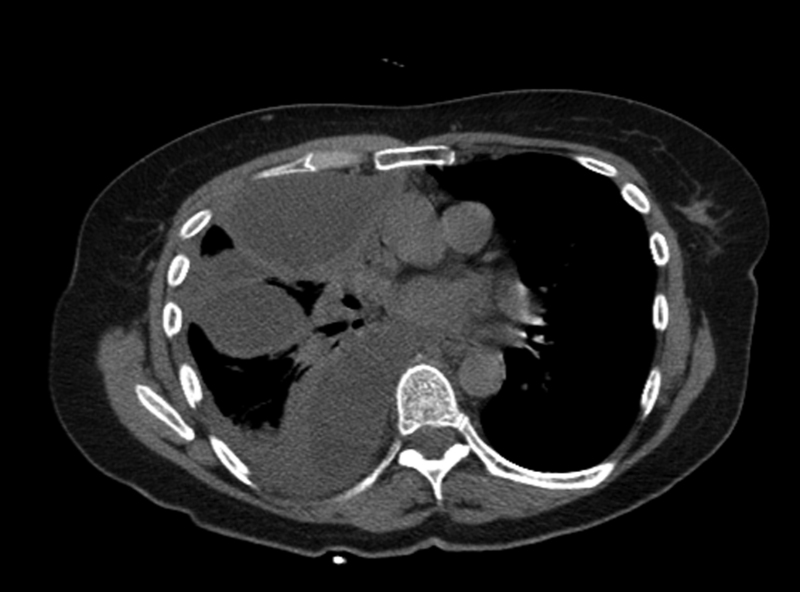 The patient responded well to a treatment that included right thoracotomy with pleural decortication and a combination of antibiotics and anti-inflammatory medications. M.pneumoniae related empyema was never reported before in adult patients and was reported in only a few pediatric patients. In our patient there was no evidence to any common pathogens even before initiating antibiotic treatment. The only pathogen detected was M.pneumoniae. In this patient, serology was not helpful in establishing the diagnosis of M.pneumoniae related diseases, as was suggested before for older patients. We suggest that M.pneumoniae related empyema is probably under-diagnosed complication due to insensitivity of serology in older patients and under use of other diagnosis methods. Mycoplasma pneumoniae is one of the most common respiratory pathogens . Generally, it causes mild respiratory diseases managed by primary care physicians. The most common presentation is community acquired pneumonia in which it is responsible for more than 20% of cases, but is responsible as well for upper respiratory illness . There are few very well documented complications caused by this pathogen. These mainly include CNS involvement but other complications as pericarditis are also reported . There are a few reasons for the lack of evidence for M.pneumoniae involvement in complications of respiratory infections, such as: under appreciation of the pathogen as being able to cause invasive disease, and the lack of feasible culture methods as is the case with other pathogens [1, 2]. Currently, diagnosis of M.pneumoniae infection [1–3] is based either on serology with it's limitations or PCR performed on clinical specimens – but the last method is not widely available in clinical microbiology labs. Here we report a case of massive empyema in adult patient caused by M.pneumoniae – a condition that was not reported before in this age group. A previously healthy 57 years old woman admitted to our hospital due to dyspnoea. Two weeks before admission she had right sided pleural pain followed by dyspnoea, without cough and without fever, these increased with time and therefore she referred herself to the hospital. Her physical examination suggested right sided pleural effusion, laboratory tests showed leukocytosis (WBC-19000/mm3 with 89% neutrophils), HGB-12.5 g/dL, platelet count 400,000 platelets/mm3, and erythrocyte sedimentation rate 34 mm/hour. C-reactive protein level was highly elevated – 45 mg/dL (normal range 0–0.5 mg/dL). The results of chemistry panel were normal except for mildly elevated alkaline phosphatase – 157 u/l (40–130 u/l). A chest CT performed on admission (figure 1) showed massive right pleural effusion, with right lung athelectasis. Chest tube was inserted to the pleural cavity and evacuated only small amount of purulent fluid, although streptokinase was injected to the pleural cavity four times. Antibiotic treatment was started using IV Cefuroxime (750 mg three times a day) and oral Roxithromycin (150 mg twice a day) for 4 days without signs of improvement. Chest CT scan. Chest CT scan of the patient showing massive right side pleural effusion with atelctasis of the lung. A repeated CT performed 4 days after admission, showed a massive amount of right sided pleural effusion with right middle and lower lobe athelectasis. Therefore, a right sided thoracotomy was performed. A significant amount of pus and fibrin was drained during the procedure, and the lung expanded normally after the pleura was decorticated on that side. Pus from the empyema (before and after starting antibiotic treatment) was cultured several times both for common pathogens as well as Mycobacteria but turned to be negative. Pathological examination of the pleura that was removed during the procedure showed fibrotic pleura covered by pus and fibrin without evidence for any organism. Given the clinical gradual and atypical course of the patient with the negative stains and cultures results, the pleural pus and fluid were also tested for M.pneumoniae using PCR. DNA was extracted from the pus using the DNAeasy tissue kit (Qiagen, Hilden, Germany). First we have utilised a Mycoplasma genus specific PCR amplifying 16SRNA DNA, doing direct amplification using the same thermal profile and GPO-3/MGSO primers as described in ref . In this test one negative and one positive controls were used for 10 samples. Surprisingly a positive typical band at the size of ~270 bp was found, suggesting the presence of Mycoplasma spp. in the sample. Therefore, we further used two sets of M.pneumoniae specie specific PCR reactions to identify if it is M.pneumoniae. The first was a nested PCR using the primers of the ATPase gene in the same conditions as described in ref . This test was shown in our lab to have a detection limit of ~20 CFU/ml (Nir-Paz et al. data on file). Two negative controls were included for every 8 samples tested in order to exclude contaminations during the nested reaction as well as a positive control for 16 reactions. This test gave a typical band at the size of 104 bp suggesting that the existence of M.pneumoniae. In order to confirm that finding, we have performed another M.pneumoniae specific PCR using the P1 gene. A direct PCR using the same primers and conditions as described in Ref  was performed. In this test one negative and one positive controls were used for 10 samples. Again this PCR gave a typical positive band at the size of 466 bp, confirming the presence of M.pneumoniae DNA in the sample. Unfortunately, only convalescent serum that was taken 30 days after the initial admission was available for serology, and it was indeterminate with a titer of 1:80 using the Serodia-Myco II assay (Fujirebio, Tokyo, Japan), and IgM negative using Mycoplasma pneumoniaea IgM EIA (ANILabsystems, Helsinki, Finland). After the surgery, the patient was gradually recovered with intravenous azythromycin treatment (500 mg once a day) for 10 days followed by 5 more days of oral therapy (250 mg once a day), In addition she was treated with oral Pyranocarboxylate (400 mg twice a day) for the first two weeks after surgery. The CRP level dropped to 9.5 mg/dl after the operation and two weeks later, the CRP level decreased into normal levels (0.2 mg/dl). At this time point the patient fully recovered without any breath or pain complaints and no residual fluid was seen in the chest X -ray. We presented a case of Mycoplasma pneumoniae related massive pyogenic pleural effusion. There was no evidence of other causative agents in repeated stains, cultures or pathological examination of the pleura before and after the patient received antibiotics. M. pneumoniae infections involves upper respiratory airway, lower respiratory airway or both; symptomatic disease typically develops gradually over a period of several days or weeks . Bronchopneumonia involving one or more lobes develops in 3–10% of infected patients, while bilateral involvement occurs in about 20% of cases . Minimal pleural effusion were suggested a few decades ago  in up to 20% of the patients when lateral decubitus films were performed, but diagnosis was based on cold agglutinin or complement fixation titers. Moreover, none of the patients in that study had any evidence of empyema. Few severe cases with significant pleural effusion and necrotizing pneumonia were reported in children . Recently, two studies in these pediatric patients suggested that at least two distinct patterns of M.pneumoniae related pleural effusion [9, 10]: the first is more benign, most probably reactive and does not contain M.pneumoniae DNA. The other, involves protracted disease and contains M.pneumoniae DNA. The pathogenesis of pleural effusion is still unclear, but the authors speculate that the presence of the DNA may elicit stronger immunologic reaction causing lung damage, with IL-8 and IL -18 play a role in the reaction [11, 12]. In extensive literature search, no reports describing M.pneumoniae associated empyema in adult or elderly patients were found. M.pneumoniae related empyema is currently considered a rare complication. Our case is unique by the old age of our patient and characterized by a subacute progress of a pulmonary disease. A massive empyema which requires thoracotomy and decortication, was never reported for this pathogen in this patient's age. Apparently, as was suggested before, serology in older people does not serve as a useful tool to support such diagnosis . Nevertheless, it might be that M.pneumoniae is a common cause of empyema complicating respiratory infection and pneumonia but is under-diagnosed due to the use of insensitive diagnostic methods. We conclude that M.pneumoniae should be thought as an etiologic agent for respiratory infection followed by empyema in older patients. This should probably be confirmed by the use of PCR or by the use of other DNA based methods. In this case report we describe the first reported empyema caused by Mycoplasma pneumoniae in an adult. M.pneumoniae is one of the common respiratory pathogens, however due to it's fastidious nature it is not commonly detected. Therefore we suggest that M.pneumoniae related empyema is probably an under-diagnosed complication due to insensitivity of serology in older patients and under use of other diagnosis methods. We thank Prof Colin Block for critical reading of the manuscript. MS, MRA, UI, and RNP cared for the patient and collected clinical data, MR performed the molecular diagnostic assays, MS and RNP drafted and revised the article. All authors read and approved the final manuscript.